We confuse happiness with the fulfilment of our desires. Happiness to us becomes something that we will get once we have all that we want. And if life doesn't go the way we want, we become sad and bitter and decide that it’s not our fate to be Happy! Happiness doesn't come from big materialistic things. It comes from small everyday things that we usually forget to enjoy in our maddening pursuit of the “Bigger Things”! For me happiness is the Methi Parantha my mother makes for breakfast, happiness is looking at the antics of the birds in on my veranda wall, happiness is a good book and a cup of coffee, happiness is people telling me they love my blog. 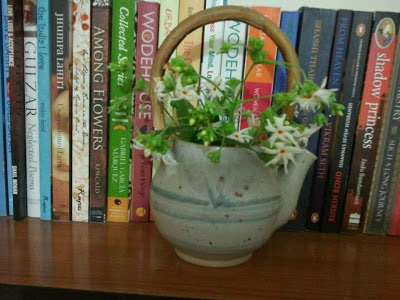 Happiness is also collecting the Parijat flowers during my early morning walks. Parijat or Harsingar is a small white flower with a bright saffron stem. This extremely fragrant and delicate flower blossoms at night and drops as soon as the first ray of the sun falls on it. Somehow this pristine flower always has a very peaceful and tranquil effect on me. There are a few Parijat trees in the park near my house and every morning the fallen flowers lie like glittering white jewels on the grass under the tree. Every day after my walk, I collect the flowers, put them in glass bowls and keep them all over the house. It always makes the rooms more fragrant and cheerful! A few days back I was not in a very good mood when I went for my walk. I was thinking of a beautiful pottery tea-pot that I had broken accidently. It was a gift from a dear friend and I valued it greatly. Pouring tea out of it had become a ritual I looked forward to every day. Now thanks to my clumsiness I could no longer use it! As I walked towards the Parijat tree to collect the flowers, I saw a few branches lying under the tree as well. On a whim I picked them up and brought them home. I was looking around for a pot small enough to hold the fragile branches, when my eyes fell on the discarded tea pot. I decided to put the stems in that broken pot, arranging them so that the broken end could not be seen. Then I decided to put the flowers in my room, next to my books. Then I clicked a picture. And as I looked at the picture, I realized that I had a few of my favourite things right in front of me .. Books, pottery and Flowers ! Happiness is not something we need to run after or look for. It’s there, right in front of us.All we need to do is change our perspective! And my obsession with it..eeeeeee! Loved the post as well :) Happiness is indeed, enjoying the small things in life. Happiness indeed lies in small things in front of us and not in material things we long for. @ Akanksha - yes it is isnt it ! @Naina - Thank you ! @PhoenxiRitu - I love Mogra too. The fragrance is divine ! So very true. Happiness doesn't depend on any external conditions, it is governed by our mental attitude. Such a lovely post Ruchira. Most people run after materialistic things and think it will make them happy. I too am a bit like that in some ways. I love new clothes and shoes :P I won't deny it. Absolutely. You pick you happiness from a mundane place and perch it right where you need it.Beautiful picture and lovely post. Di you already know my love for this particular pic. it has everything to make me happy. But the post you have written has something for each one of us. Those two cents of yours holds one of the most amazing truths of life "Happiness is not something we need to run after or look for. It’s there, right in front of us.All we need to do is change our perspective!" Yes, spot-on. Happiness is usually found in places where we don't look and food is definitely one of them I love the fact that I can enjoy food and relish it in leisure unlike others who rush through it. Loved the peek of your book-shelf. May you always find happiness everywhere. @Shilpa – Yes, happiness is all in the mind ! Thank you I love books .. and flowers ! Flowers do have the power to instantly perk you up ! @Lazy pineapple – I love new clothes and shoes too ! And also bags :) But its also the small small things that make us happy isn’t it ! @Sangeeta – Thank you ! We must learn to look for happiness in mundane things ! @Corinne – Watermelon – yumm !! @Shruti – Thank you so much ! Glad you enjoyed reading it. Happiness is to be felt in the smallest moments of life. It is a state of mind. Technically its better to find happiness in little things bcoz we are surrounded by little things more often. The happiness from big things come rarely. Love you too :) Hugz! BTW, I will be in Delhi sometime between Jan-Mar...we should meet...I will keep you posted of my plans. @Susan - Thank you so much ! I wish you happiness too ! @Harleena - absolutely true ! Happiness is a state of mind ! We keep looking towards the future for happiness .. and we forget that we must learn to be happy now ! @Shachi - Thats so wonderful ! I so look fwd to meeting you ! that is so true.. its always the little things that give us the most happiness and if you think about it , that happiness also lasts longer ..
Happiness is when Coco comes wagging his tail to me; when my little son comes and hugs me tightly; when hubby holds my hand with a certain warmth and steers me away from something on the road; happiness is in talking to my friends. Wish more of us could appreciate the ones in our life more than the things they buy for us. BA lyrical post and harsingar -- wow! My favorite is raat ki raani with its heady scent. We used to call them Harsingar ke phool....are they the same? Happiness indeed is in small things... a warm smile, a genuine hug, dew drops, fresh breeze....and methi paranthas of course. What a profound and beautiful piece! We tend to take the Methi Parantha, the bird and the good book over the cup of coffee in our life for granted. The story about the pot has a fablesque charm. @Scorpria - Yes they do smell divine don't they ! @Rachna - I love Raat ki Rani too ! @Alka - Yes harsingar is another name for Parijat ! @Umashankar - Yes that's the sad part isn't it - that we take such things for granted, never realizing just how much we have! We do indeed look for happiness in the fulfilment of our never ending desires. no wonder we don't find it at all. the way you have managed to bring together the things that make you happy is wonderful. For me these days, plucking the strings of my veena is the happiest thing. what if I have lost touch after 34 years of not playing it? The music is still divine. Very true. Happiness is a feeling within ourselves. Most of the times little things bring it up. Lovely picture of those incredibly fragrant flowers. The picture says it all..happiness just like beauty lies in the heart of the beholder! Such a beautiful post! I always admire the simple and smooth flow of your words! lоοk at this frеe guide on surviνаl at http://survіve. And I so agree with all that you have said in this post. @Zephyr – I am so glad you picked up the veena again. Music is so soothing and divine ! @Tarang – Thank you and welcome here ! @A day in the life of a mom – very true ! It is our responsibility to find happiness within us  Welcome here ! I was angry about something this evening and decided to do what I usually do at times like these-read.. This post made my day Ruchira,I revisited my childhood home,my bedroom and the Parijaat tree just outside my window.I wrote love poems in my diary in the dead of the night looking at the Parijaat. Silly dreamer...yeah,I am that !Loved the post. @sharmila - Welcome here ! And thanks for your lovely comment ! You just made my day !